Thank You Cards for Kids - Make One and Copy It! Getting kids to write thank you cards can be tricky. Heck, getting myself to write thank you cards can be tricky. Have them make ONE nice thank you card or artwork then make as many photocopies as you need. Do this after Christmas or a birthday party or anytime thank you cards are warranted. Here’s our latest iteration, using colorful washi tape for the letters. The plan was to do tape resist, as we’ve done in the past and again this year for our Happy New Year banner. But the patterned and colorful washi tape was so happy and pretty that we kept it on (for some of the thank you cards anyway). Shaping the washi tape letters is best for Kindergarten and up. 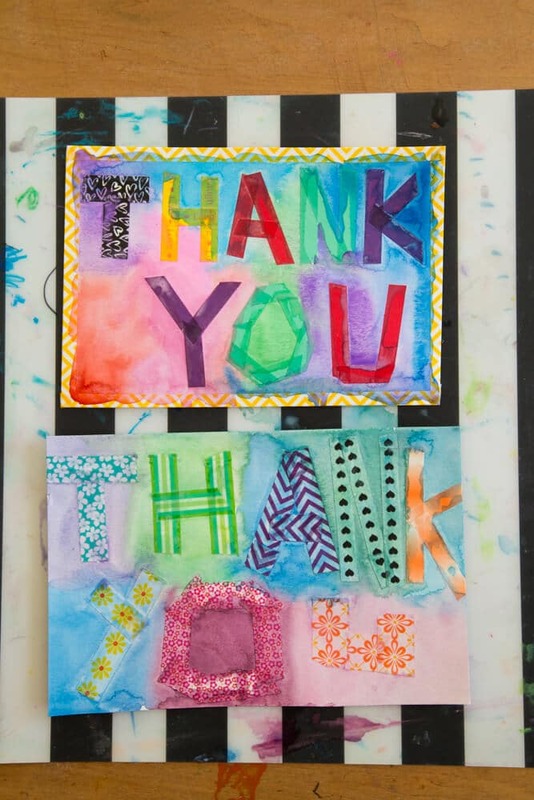 If you have a younger child, they can create a more abstract artwork with the washi tape and watercolors, then you or they can hand write “Thank You” somewhere on the front or back. First, use the washi tape to spell “Thank You.” Cut small sections of the washi tape for each section of the letters and press them to the paper. For curved letters, such as O, simply use more short sections of tape. You can also cut washi tape sections in half lengthwise for skinnier strips, if necessary. Note :: This is the set of washi tape we used. I received lots of questions about it on Instagram! Maia gifted it to me for Christmas and I’m guessing it came from Michael’s or A.C. Moore. Then, paint over or around your washi tape words with watercolor paint. Continue until your thank you cards are completely painted. I LOVE the combination of the decorative washi tape with the watercolor paint! And even though we had planned to make these tape resist thank you cards, I was all for keeping the washi tape ON after seeing how they looked. The kids had other ideas, though, and really wanted to pull off their tape for the full tape resist effect. Here’s Daphne’s tape resist thank you card, signed. And here’s Maia’s. Since her watercolor background was a bit light in areas (especially noticeable after we ran it through the copy machine), she wanted to outline her letters with pen. Next, make color copies of your thank you cards. If you don’t have a printer/copier like this, head to a place like Kinko’s or Staples to have your copies made. Finally, mail or give your thank you cards to everyone who should get one! See how easy that was?! Make ONE creative thank you card, copy as many as you need, and send them off! Kids will enjoy the process rather than thinking of it as an endless chore and the recipient will feel properly thanked. Note :: We usually just send the photocopies as is but sometimes add a brief handwritten note by the child or by me in the margin. Copy your thank you cards onto card stock or nicer paper. Take a photo of your child holding her thank you card artwork (as with these Valentine’s Day Photo Cards.) Have prints made and mail them. Scan your child’s thank you card, reduce in size, then print out several to a page. Paste the smaller images onto blank cards. Scan your child’s thank you card, then have post cards printed from the card. 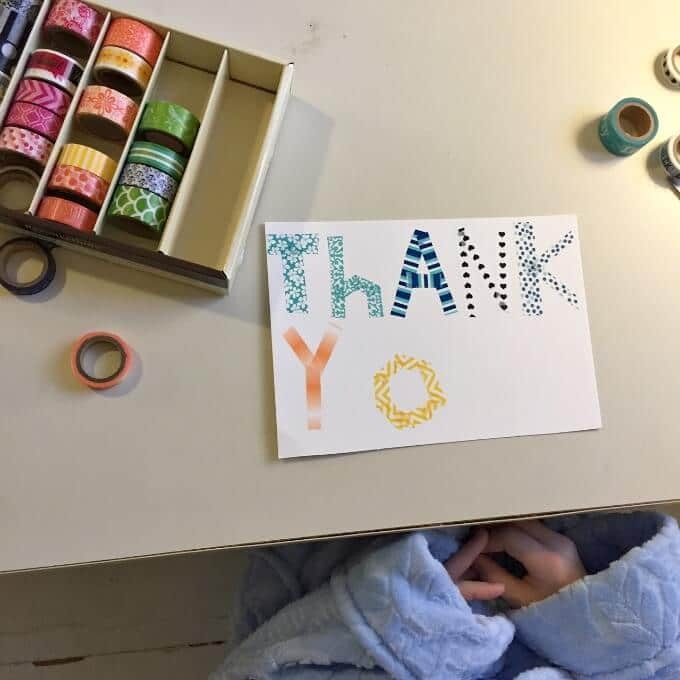 Use sticker letters instead of washi tape to write “thank you”. Keep them on or remove after painting for a sticker resist effect. Use the washi tape (or sticker letters) to write any other brief message you like. I Love You. Happy Birthday. Get Well. I Miss You. Happy New Year. How about you? Any tips, tricks, or ideas for getting kids to write thank you cards after a party or holiday? What a BRILLIANT idea! I’ve been dreading trying to get my 3yo & 5yo to make half a dozen thank you cards each. We will definitely be doing this. Thank you for sharing ? I have the same Washi set — $10 at Michaels. That Amazon price is high! I believe it, Katy. Some things on Amazon seem to be better deals than you can find in person, but some prices seem inflated. Oh, I love all things washi tapes! You’re right, getting kids into an art project can be tricky, but sure they can come up with the prettiest, most spontaneous ideas. Will definitely try this with the kids. Thank you for sharing! By the way, it’s my first time here, looking forward to more visits. Very creative way to use our old washi tapes! I’m sure my son will love this idea! Thanks, we’ll try it in the afternoon! I love this idea! Thank you creative people! Once you applied the water color over the washi tape, did the tape stay on?